2018 Yamaha SRX 120 CONQUER SNOW The SRX120 receives a face lift for 2018 to accommodate for the growing family of youth snowmobiles that Yamaha has to offer. 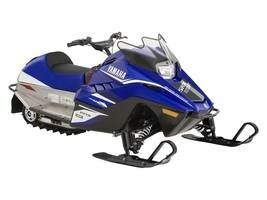 The SRX120 is a great option to introduce your youngster to the sport of snowmobiling. Loaded with safety features to ensure your kid has an enjoyable, unintimidating experience. YAMAHA GENESIS YOUTH ENGINE 1 cylinder 123cc Centrifugal clutch 1 x B-18 carburetor .46 gal (1.7L) fuel capacity SAFETY LED Tailight continuously illuminated when engine on Tail whip flag New handle bar warmers SUSPENSION Double A-Arm (front) Hydraulic (front) Slide rail,torsion spring (rear) Features may include: PERFORMANCE Governor Speed Control An easy to adjust governor allows you to control the top speed and acceleration of the vehicle, allowing you to slowly increase the performance as your child gains confidence and skill. Transistorized Ignition A full electronic ignition system ensures quick and easy starts, season after season with no adjustments to make. HANDLING Double Wishbone Front Suspension Patterned after Yamaha's full-size, the fully functional, double-wishbone front suspension features coil-over shocks and 3-inches of travel. Front and Rear Bumpers These handy items are a must have feature helping protect the chassis from unexpected bumps and bangs. They also come to the aid when the need to pull around either end of the machine is required.